In the Node Library, select a Peg node and drag it to the Node view. In the Node Library view, select the Move tab. 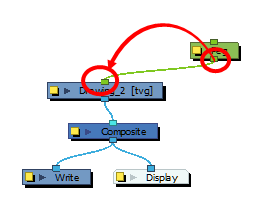 Select a Peg node and drag it to the Node view. You can also press Ctrl + P (Windows/Linux) or ⌘ + P (Mac OS X). In the Node view, select the Peg node's output port and connect it to a Drawing or Camera node. The advanced connections in the Node view are shown in the Timeline view, unless they cannot be reproduced in a timeline layout.